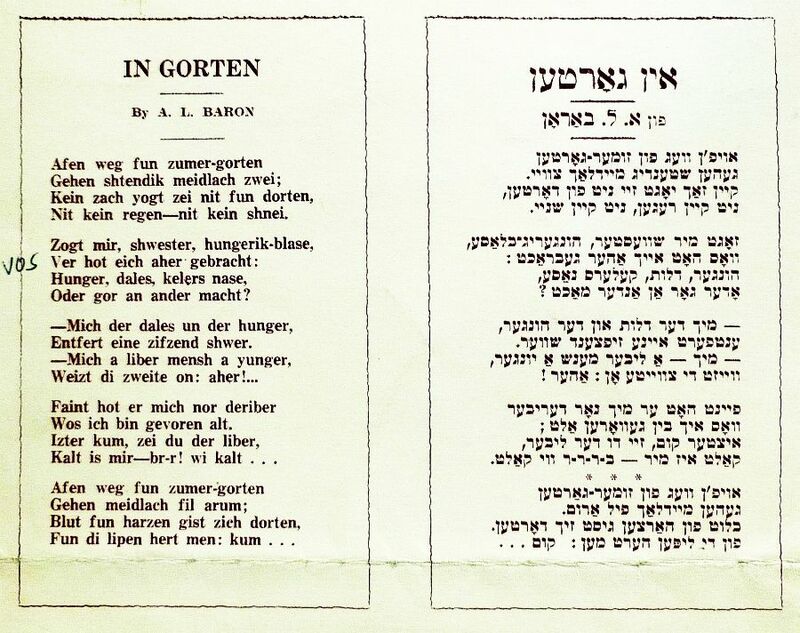 Polish Jewish Cabaret: In Gortn - as sung by Vera Rosanka, "Di yidishe shikse"
In Gortn - as sung by Vera Rosanka, "Di yidishe shikse"
I bought this sheet music on eBay. What a peculiar song! The tune and arrangement seem a mixture of a folk song and an art song. The text is - obscure. The music is by Bernard Matlin, the odd text is by A. L. Baron. It was published in New York in 1936. 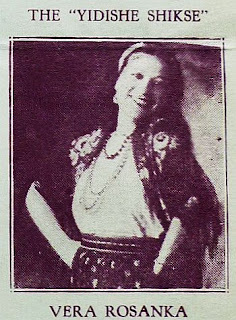 Shifra Viner, aka Vera Rozanka (Rosanka) (1889-1960), was always advertised as Di yidishe shikse, "The Jewish non-Jewish girl." She wore peasant clothes. Billboard said she had a "wavering soprano" voice, I've never heard her. Aviva Enoch played piano on our recording here. Here is the text in standard transliteration, and translation as best as I can make out. Is girl number two suggesting that the singer become her new love, since the previous one thought she was too old? Or is the singer her love, encountering her in the garden? Or neither of the above. Theories welcome. Zogt mir shvester hungrik, blase, vos hot aykh aher gebrakht? On the path from the summer garden, two girls are always walking. Nothing can drive them away, not rain, not snow. Tell me, hungry pale sisters, what brought you here? Was it hunger, poverty, the damp of a cellar, or something else completely? "For me, it was poverty and hunger," answered one, sighing heavily. "For me, it was my love, a younger man," the other one points: here! "He hates me just because I've grown old. Now come, you be the beloved. I'm cold, brr, so cold."